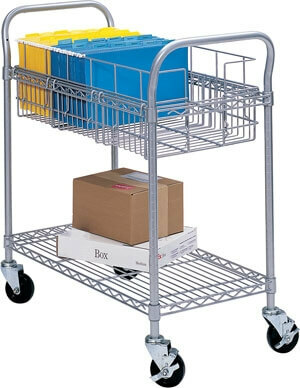 The Safco 24" Wire Mail Cart 5235GR is a durable and easy-to-use cart that features welded wire construction with convenient dual handles, a top basket designed to hold up to 75 legal file folders (not included) and a bottom shelf that accommodates parcels to make your mail distribution more efficient. Experience smooth movement on 4" swivel casters (2 of the 4 are locking type casters). With a 600 lb weight capacity this cart is tough.